Birthplace of Henry Wadsworth Longfellow, Portland, Maine, c. 1910. The house was demolished in 1955. Longfellow was born on February 27, 1807, to Stephen Longfellow and Zilpah (Wadsworth) Longfellow in Portland, Maine, then a district of Massachusetts, and he grew up in what is now known as the Wadsworth-Longfellow House. His father was a lawyer, and his maternal grandfather, Peleg Wadsworth, was a general in the American Revolutionary War and a Member of Congress. He was named after his mother's brother Henry Wadsworth, a Navy lieutenant who had died three years earlier at the Battle of Tripoli. Longfellow was the second of eight children; his siblings were Stephen (1805), Elizabeth (1808), Anne (1810), Alexander (1814), Mary (1816), Ellen (1818) and Samuel (1819). Longfellow was of entirely English ancestry, all of which had been in New England since the early 1600s. Longfellow attended a dame school at the age of three and by age six was enrolled at the private Portland Academy. In his years there he earned a reputation as being very studious and became fluent in Latin. His mother encouraged his enthusiasm for reading and learning, introducing him to Robinson Crusoe and Don Quixote. He published his first poem, a patriotic and historical four-stanza poem called "The Battle of Lovell's Pond", in the Portland Gazette on November 17, 1820. He stayed at the Portland Academy until the age of fourteen. He spent much of his summers as a child at his grandfather Peleg's farm in the western Maine town of Hiram. He pursued his literary goals by submitting poetry and prose to various newspapers and magazines, partly due to encouragement from Professor Thomas Cogswell Upham. Between January 1824 and his graduation in 1825, he published nearly 40 minor poems. About 24 of them appeared in the short-lived Boston periodical The United States Literary Gazette. When Longfellow graduated from Bowdoin, he was ranked fourth in the class, and had been elected to Phi Beta Kappa. He gave the student commencement address. After graduating in 1825, he was offered a job as professor of modern languages at his alma mater. The story, possibly apocryphal, is that an influential trustee, Benjamin Orr, had been so impressed by Longfellow's translation of Horace that he was hired under the condition that he travel to Europe to study French, Spanish, and Italian. Whatever the motivation, he began his tour of Europe in May 1826 aboard the ship Cadmus. His time abroad would last three years and cost his father $2,604.24. He traveled to France, Spain, Italy, Germany, back to France, then England before returning to the United States in mid-August 1829. While overseas, he learned French, Spanish, Portuguese, and German, mostly without formal instruction. In Madrid, he spent time with Washington Irving and was particularly impressed by the author's work ethic. Irving encouraged the young Longfellow to pursue writing. While in Spain, Longfellow was saddened to learn that his favorite sister, Elizabeth, had died of tuberculosis at the age of 20 that May while he was abroad. On August 27, 1829, he wrote to the president of Bowdoin that he was turning down the professorship because he considered the $600 salary "disproportionate to the duties required". The trustees raised his salary to $800 with an additional $100 to serve as the college's librarian, a post which required one hour of work per day. During his years teaching at the college, he translated textbooks in French, Italian and Spanish; his first published book was in 1833, a translation of the poetry of medieval Spanish poet Jorge Manrique. He also published a travel book, Outre-Mer: A Pilgrimage Beyond the Sea, first published in serial form before a book edition was released in 1835. Shortly after the book's publication, Longfellow attempted to join the literary circle in New York and asked George Pope Morris for an editorial role at one of Morris's publications. 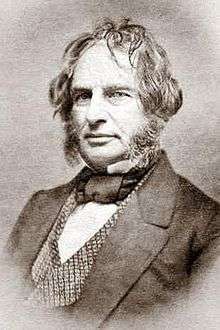 Longfellow considered moving to New York after New York University considered offering him a newly created professorship of modern languages, though there would be no salary. The professorship was not created and Longfellow agreed to continue teaching at Bowdoin. It may have been joyless work. He wrote, "I hate the sight of pen, ink, and paper... I do not believe that I was born for such a lot. I have aimed higher than this". In December 1834, Longfellow received a letter from Josiah Quincy III, president of Harvard College, offering him the Smith Professorship of Modern Languages with the stipulation that he spend a year or so abroad. There, he further studied German as well as Dutch, Danish, Swedish, Finnish, and Icelandic. In October 1835, during the trip, his wife Mary had a miscarriage about six months into her pregnancy. She did not recover and died after several weeks of illness at the age of 22 on November 29, 1835. Longfellow had her body embalmed immediately and placed in a lead coffin inside an oak coffin which was then shipped to Mount Auburn Cemetery near Boston. He was deeply saddened by her death, writing "One thought occupies me night and day... She is dead — She is dead! All day I am weary and sad". Three years later, he was inspired to write the poem "Footsteps of Angels" about her. Several years later, he wrote the poem "Mezzo Cammin," which expressed his personal struggles in his middle years. When he returned to the United States in 1836, Longfellow took up the professorship at Harvard. He was required to live in Cambridge to be close to the campus and, therefore, rented rooms at the Craigie House in the spring of 1837, now preserved as the Longfellow House–Washington's Headquarters National Historic Site. The home, built in 1759, had once been the headquarters of George Washington during the Siege of Boston beginning in July 1775. Elizabeth Craigie, widow of Andrew Craigie, owned the home and rented rooms on the second floor. Previous boarders also included Jared Sparks, Edward Everett, and Joseph Emerson Worcester. Longfellow began publishing his poetry, including the collection Voices of the Night in 1839. The bulk of Voices of the Night, Longfellow's debut book of poetry, was translations though he also included nine original poems and seven poems he had written as a teenager. Ballads and Other Poems was published shortly thereafter in 1841 and included "The Village Blacksmith" and "The Wreck of the Hesperus", which were instantly popular. Longfellow also became part of the local social scene, creating a group of friends who called themselves the Five of Clubs. Members included Cornelius Conway Felton, George Stillman Hillard, and Charles Sumner, the latter of whom would become Longfellow's closest friend over the next 30 years. As a professor, Longfellow was well liked, though he disliked being "constantly a playmate for boys" rather than "stretching out and grappling with men's minds." Longfellow met Boston industrialist Nathan Appleton and his family, including his son Thomas Gold Appleton, in the town of Thun, Switzerland. There, he began courting Appleton's daughter, Frances "Fanny" Appleton. At first, the independent-minded Appleton was not interested in marriage but Longfellow was determined. In July 1839, he wrote to a friend: "[V]ictory hangs doubtful. The lady says she will not! I say she shall! It is not pride, but the madness of passion". 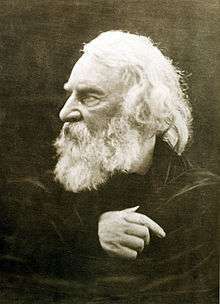 His friend George Stillman Hillard encouraged Longfellow in the pursuit: "I delight to see you keeping up so stout a heart for the resolve to conquer is half the battle in love as well as war". During the courtship, Longfellow frequently walked from Cambridge to the Appleton home in Beacon Hill in Boston by crossing the Boston Bridge. That bridge was replaced in 1906 by a new bridge which was later renamed the Longfellow Bridge. In late 1839, Longfellow published Hyperion, a book in prose inspired by his trips abroad and his unsuccessful courtship of Fanny Appleton. Amidst this, Longfellow fell into "periods of neurotic depression with moments of panic" and took a six-month leave of absence from Harvard to attend a health spa in the former Marienberg Benedictine Convent at Boppard in Germany. After returning, Longfellow published a play in 1842, The Spanish Student, reflecting his memories from his time in Spain in the 1820s. There was some confusion over its original manuscript. After being printed in Graham's Magazine, its editor Rufus Wilmot Griswold saved the manuscript from the trash. Longfellow was surprised to hear that it had been saved, unusual for a printing office, and asked to borrow it so that he could revise it, forgetting to return it to Griswold. The often vindictive Griswold wrote an angry letter in response. 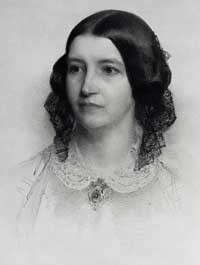 On May 10, 1843, after seven years, Longfellow received a letter from Fanny Appleton agreeing to marry him and, too restless to take a carriage, walked 90 minutes to meet her at her house. They were soon married. Nathan Appleton bought the Craigie House as a wedding present to the pair. Longfellow lived there for the rest of his life. His love for Fanny is evident in the following lines from Longfellow's only love poem, the sonnet "The Evening Star", which he wrote in October 1845: "O my beloved, my sweet Hesperus! My morning and my evening star of love!" He once attended a ball without her and noted, "The lights seemed dimmer, the music sadder, the flowers fewer, and the women less fair." He and Fanny had six children: Charles Appleton (1844–1893), Ernest Wadsworth (1845–1921), Fanny (1847–1848), Alice Mary (1850–1928), Edith (1853–1915), and Anne Allegra (1855–1934). Their second-youngest daughter, Edith, married Richard Henry Dana III, son of the popular writer Richard Henry Dana, Jr., author of Two Years Before the Mast. 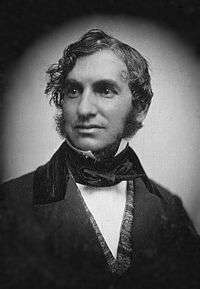 When the younger Fanny was born on April 7, 1847, Dr. Nathan Cooley Keep administered ether as the first obstetric anesthetic in the United States to Fanny Longfellow. 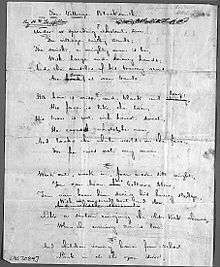 A few months later, on November 1, 1847, the poem Evangeline was published for the first time. His literary income was increasing considerably: in 1840, he had made $219 from his work but the year 1850 brought him $1,900. On June 14, 1853, Longfellow held a farewell dinner party at his Cambridge home for his friend Nathaniel Hawthorne, who was preparing to move overseas. In 1854, Longfellow retired from Harvard, devoting himself entirely to writing. He was awarded an honorary doctorate of laws from Harvard in 1859. 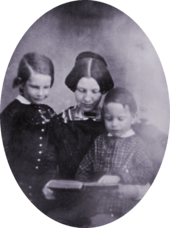 On July 9, 1861, a hot day, Fanny was putting locks of her children's hair into an envelope and attempting to seal it with hot sealing wax while Longfellow took a nap. Her dress suddenly caught fire, though it is unclear exactly how; it may have been burning wax or a lighted candle that fell on her dress. Longfellow, awakened from his nap, rushed to help her and threw a rug over her, though it was too small. He stifled the flames with his body as best he could, but she was already badly burned. Over a half a century later, Longfellow's youngest daughter Annie explained the story differently, claiming that there had been no candle or wax but that the fire had started from a self-lighting match that had fallen on the floor. In both versions of the story, however, Fanny was taken to her room to recover and a doctor was called. She was in and out of consciousness throughout the night and was administered ether. The next morning, July 10, 1861, she died shortly after 10 o'clock after requesting a cup of coffee. Longfellow, in trying to save her, had burned himself badly enough for him to be unable to attend her funeral. His facial injuries led him to stop shaving, thereafter wearing the beard which became his trademark. Longfellow spent several years translating Dante Alighieri's Divine Comedy. To aid him in perfecting the translation and reviewing proofs, he invited friends to weekly meetings every Wednesday starting in 1864. The "Dante Club", as it was called, regularly included William Dean Howells, James Russell Lowell, Charles Eliot Norton and other occasional guests. The full three-volume translation was published in the spring of 1867, though Longfellow would continue to revise it, and went through four printings in its first year. By 1868, Longfellow's annual income was over $48,000. In 1874, Samuel Cutler Ward helped him sell the poem "The Hanging of the Crane" to the New York Ledger for $3,000; it was the highest price ever paid for a poem. During the 1860s, Longfellow supported abolitionism and especially hoped for reconciliation between the northern and southern states after the American Civil War. When his son was injured during the war, he wrote the poem "Christmas Bells", later the basis of the carol I Heard the Bells on Christmas Day. He wrote in his journal in 1878: "I have only one desire; and that is for harmony, and a frank and honest understanding between North and South". Longfellow, despite his aversion to public speaking, accepted an offer from Joshua Chamberlain to speak at his fiftieth reunion at Bowdoin College; he read the poem "Morituri Salutamus" so quietly that few could hear him. The next year, 1876, he declined an offer to be nominated for the Board of Overseers at Harvard "for reasons very conclusive to my own mind". Contemporary writer Edgar Allan Poe wrote to Longfellow in May 1841 of his "fervent admiration which [your] genius has inspired in me" and later called him "unquestionably the best poet in America". However, after Poe's reputation as a critic increased, he publicly accused Longfellow of plagiarism in what has been since termed by Poe biographers as "The Longfellow War". His assessment was that Longfellow was "a determined imitator and a dextrous adapter of the ideas of other people", specifically Alfred, Lord Tennyson. His accusations may have been a publicity stunt to boost readership of the Broadway Journal, for which he was the editor at the time. Longfellow did not respond publicly, but, after Poe's death, he wrote: "The harshness of his criticisms I have never attributed to anything but the irritation of a sensitive nature chafed by some indefinite sense of wrong". The first Longfellow stamp was first issued in Portland, Maine, on February 16, 1940. Longfellow was the most popular poet of his day. As a friend once wrote to him, "no other poet was so fully recognized in his lifetime". Many of his works helped shape the American character and its legacy, particularly with the poem "Paul Revere's Ride". He was such an admired figure in the United States during his life that his 70th birthday in 1877 took on the air of a national holiday, with parades, speeches, and the reading of his poetry. Over the years, Longfellow's personality has become part of his reputation. He has been presented as a gentle, placid, poetic soul: an image perpetuated by his brother Samuel Longfellow, who wrote an early biography which specifically emphasized these points. As James Russell Lowell said, Longfellow had an "absolute sweetness, simplicity, and modesty". At Longfellow's funeral, his friend Ralph Waldo Emerson called him "a sweet and beautiful soul". In reality, Longfellow's life was much more difficult than was assumed. He suffered from neuralgia, which caused him constant pain, and he also had poor eyesight. He wrote to friend Charles Sumner: "I do not believe anyone can be perfectly well, who has a brain and a heart". He had difficulty coping with the death of his second wife. Longfellow was very quiet, reserved, and private; in later years, he was known for being unsocial and avoided leaving home. He had become one of the first American celebrities and was also popular in Europe. It was reported that 10,000 copies of The Courtship of Miles Standish sold in London in a single day. Children adored him and, when the "spreading chestnut-tree" mentioned in the poem "The Village Blacksmith" was cut down, the children of Cambridge had the tree converted into an armchair which they presented to the poet. In 1884, Longfellow became the first non-British writer for whom a commemorative sculpted bust was placed in Poet's Corner of Westminster Abbey in London; he remains the only American poet represented with a bust. In 1909, a seated statue of Longfellow sculpted by William Couper was unveiled in Washington, D. C.
More recently, he was honored in March 2007 when the United States Postal Service issued a stamp commemorating him. A number of schools are named after him in various states as well. Neil Diamond's 1974 hit song, "Longfellow Serenade", is a reference to the poet. He is a protagonist in Matthew Pearl's murder mystery The Dante Club (2003). Longfellow's popularity rapidly declined, beginning shortly after his death and into the twentieth century as academics began to appreciate poets like Walt Whitman, Edwin Arlington Robinson, and Robert Frost. In the twentieth century, literary scholar Kermit Vanderbilt noted, "Increasingly rare is the scholar who braves ridicule to justify the art of Longfellow's popular rhymings." 20th-century poet Lewis Putnam Turco concluded "Longfellow was minor and derivative in every way throughout his career... nothing more than a hack imitator of the English Romantics." ↑ Farnham, Russell Clare and Dorthy Evelyn Crawford. A Longfellow Genealogy: Comprising the English Ancestry and Descendants of the Immigrant William Longfellow of Newbury, Massachusetts, and Henry Wadsworth Longfellow. Walrus Publishers, 2002. ↑ "Winthrop Hall". bowdoin.edu. Retrieved 2016-07-31. ↑ Burstein, Andrew. The Original Knickerbocker: The Life of Washington Irving. New York: Basic Books, 2007: 195. ISBN 978-0-465-00853-7. ↑ Rosenberg, Chaim M. (2010). The Life and Times of Francis Cabot Lowell, 1775–1817. Plymouth: Lexington Books. ↑ Loving, Jerome. Walt Whitman: The Song of Himself. University of California Press, 1999: 52. ISBN 0-520-22687-9. ↑ Lewis, R. W. B. The American Adam: Innocence, Tragedy, and Tradition in the Nineteenth Century. Chicago: The University of Chicago Press, 1955: 79. 1 2 Meyers, Jeffrey. Edgar Allan Poe: His Life and Legacy. New York: Cooper Square Press, 1992: 171. ISBN 0-8154-1038-7. ↑ Reynolds, David S. Walt Whitman's America: A Cultural Biography. New York: Vintage Books, 1995: 353. ISBN 0-679-76709-6. ↑ Hyatt, Wesley (1999). The Billboard Book of #1 Adult Contemporary Hits (Billboard Publications), page 150.